Violence at abortion clinics has been down since George Tiller was murdered in 2009, and part of the reason may be that the Obama administration is doing more to prosecute anti-choice protesters who break the law. Some say the FBI could have prevented Tiller's death if Scott Roeder had been investigated more thoroughly, but under the Bush administration, the federal goverment generally didn't do much to stop harassment outside clinics. During Bush's tenure, the Jutice Department only filed one case against a protester who violated the Freedom of Accesss to Clinic Entrances Act or FACE Act. Since Obama has been in office, the Department's civil rights division has already filed eight cases. 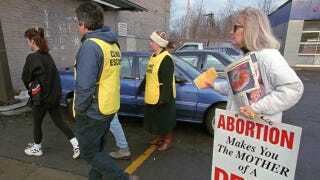 The FACE Act was signed into law in 1994, and makes it illegal for protesters to block access to abortion clinics or threaten patients with violence. The civil suits filed by the Justice Department aim to create buffer zones around clinics for protesters who have been known to violate the law. NPR reports that in the past two years, representatives from the Justice Department and the FBI have been meeting with abortion-rights groups and medical providers to explain what they do and their efforts to prevent violence against doctors and patients. Justice Department spokeswoman Xochitl Hinojosa says that they take "seriously our responsibility to enforce FACE fully and fairly," but emphasized that it isn't only focused on protecting the rights of those seeking and providing abortions. She explained, "The department has stepped up civil rights enforcement across the board, and will continue to vigorously enforce all the laws under its jurisdiction, including the FACE Act." "There's been a substantial difference between this administration and the one immediately prior ... From where we sit, there's currently much greater willingness to carefully assess incidents when they occur and to proceed with legal action when appropriate." "One of the dangers we have seen is that the people who commit the major violent acts often started with minor violent acts, and they were never arrested, so their activities escalated." While the level of violence has decreased, there have still been several troubling incidents this summer. Two clinics were attacked with Molotov cocktails and police arrested a man who said he wanted to shoot two abortion providers in Wisconsin. While it's good to know that authorities are taking these incidents more seriously, it's also disturbing that politics seems to affect the federal government's commitment to protecting the lives of patients and doctors.